View a list of discussion questions from The Authentic Voice DVD which can used in a traditional classroom setting, with small discussion groups, or for self-directed learning. 1. Allie Shah of the Minneapolis Star Tribune says she compensated for what she didn’t know about Somali culture by reading books and finding knowledgeable sources. Choose a culture you know little about. How else might you learn more about it? 2. Nimco at first objected to photographer Rita Reed’s picture of a boy playfully pushing her. Discuss Shah’s rationale for using the picture. What would you have done? 3. Shah explains why she used the powerful phrase “cultural apartheid” to describe the segregation she witnessed in the school cafeteria. What do you think of her explanation? What other words or phrases would you use to describe that scene? 1. Videotape editor Karyne Holmes and producer Craig Franklin of KRON-TV in San Francisco had a heated debate over a decision to use the phrase “fast-twitch muscles.” What do you think was so controversial about those words? 2. Throughout the process of writing and editing, the KRON team made a point of getting opinions from colleagues who had a variety of views and experiences. What’s the value of that sort of vetting? When do you think it’s necessary? 3. Franklin and anchor Pete Wilson argue that it’s not always necessary to give voice to those who espouse what Wilson called the “old nineteenth-century way of looking at race.” How do you feel about their reasoning? Teacher’s Guide: What is Race? 1. Describe any instances of racial or ethnic tensions you’ve experienced that were similar to those between Craig Franklin and Karyne Holmes of KRON-TV in San Francisco. Were you surprised to learn the tensions were there? 2. Holmes and Franklin resolved their conflict by taking a walk and talking. What techniques have you used to resolve conflicts with those different from you? What were those experiences like? 3. Holmes and Franklin each say they had to undergo a personal change in order to work together again. What ways, if any, do you need to change in order to work better with someone of a different race or ethnicity? 1. In using the phrase “black Miami,” Mirta Ojito of The New York Times gives the impression that there is one black community and that it’s run-down. What do you think about this? According to the U.S. Census, what is the socioeconomic profile of people in your community by race and ethnicity? 2. Ojito says she sometimes repeats what sources say back to them when she thinks quotes are controversial. What other ways might a journalist ensure accuracy during an interview? 3. Ojito says she told Joel some of the things Achmed said about black people but didn’t tell Achmed what Joel said about white people. Discuss her decision. 1. ABCNEWS 20/20 Correspondent Lynn Sherr said she needed to learn more about the history of passing in order to tell this story. What did you know about passing before seeing “The Family Secret”? How else do people pass in society? 2. Having heard producer Alice Irene Pifer and Sherr talk about their reasons for using Jill’s comment that she “hated white people,” would you have any concerns about using that sound bite in the story? 3. Pifer made a point of assembling a racially mixed team to produce “The Family Secret”. Sherr says that it’s important to have a “racially mixed everything” when doing a story on race but that it’s not absolutely necessary. What’s your opinion about this issue? 1. When you think about the future of race and ethnic relations, how different do you expect your journalism to be compared to what anchor Ted Koppel and producer Eric Wray of ABCNEWS’ Nightline have done? 2. The story shows some of the white sources interviewed at a nightclub and in the mall. In what other settings might the producers have interviewed those sources? 3. Koppel said he sometimes had to sweet-talk people into doing interviews. What are ethical and unethical ways to persuade people to talk? 1. Reporter Jodi Rave, whose family had dealt for years with the Bureau of Indian Affairs (BIA), said she still had a lot to learn in order to do this story. What do you know about the role of the BIA? What more would you like to know? 2. Rave supports her decision to use Sara Bernal’s ungrammatical quote. In what other ways might you capture someone’s voice in addition to using his or her incorrect grammar? 3. Rave had strong and specific guidelines for describing the ethnicity of Native people in this series. How can a journalist make a sound decision about using racial and ethnic descriptors? 1. ABCNEWS Nightline Correspondent John Donvan says that a big part of the story is that Asian Americans are sometimes not considered to be real Americans. What other racial or ethnic groups do you think share that struggle? 2. Donvan says that asking questions like “What’s bothering you?” drove his reporting to a deeper level. What other questions would you ask to get to the essence of a story? 3. Donvan assumed that Bill Richardson’s Hispanic heritage would help him understand the fears Asian Americans expressed in the story. What do you think about that assumption? 1. AP Reporter Todd Lewan said he didn’t know before doing the story that southern black families in the 1800s and early 1900s had accumulated wealth through land ownership. What do you know about this subject? 2. Reporters Dolores Barclay and Lewan persisted when they met resistance while trying to get information from some landowners and government officials about land grabs. What additional skills can a journalist use to get information from reticent sources? 3. Editor Bruce DeSilva and reporters Barclay and Lewan say there were good reasons not to include pictures of the current owners of land taken from black Americans. What do you think about their explanations? 1. When talking about Cisco and Faisal, Anne Hull of The Washington Post refers to stereotypes about immigrants. What does your research tell you about immigrants and their drive to succeed? 2. Hull says she tries to “adopt the world” of her “adopted world.” What obstacles exist for journalists trying to report through immersion and observation? 3. Hull says that she now wishes she had found a word other than “orchid” to describe Amy Nguyen’s skin. She also believes journalists should not cave in to outside pressure. Can this conflict be reconciled? 1. CBS News Correspondent Bob Simon invokes two icons in U.S. history: the Trail of Tears and the Underground Railroad. How are they similar to and different from Jose Gutierrez’s journey? 2. Simon and producer Steve Glauber say it is always preferable to have English-speaking people appear in their stories. What techniques can journalists use to convey the views of those who speak languages other than English? 3. Simon and Glauber say Bruce Harris sufficiently represented the view held by some Guatemalans that Gutierrez was a victim not a hero, therefore making it unnecessary to include interviews with Guatemalans expressing this opinion. What do you think of their position? 1. Elizabeth Llorente of The Record in Bergen, N.J., discovered in her reporting that some Korean business owners would unintentionally offend white customers by locking them out rather than risking the embarrassment of speaking poor English. What other examples can you think of where such cultural misunderstandings have occurred? 2. Llorente says it took a lot of reporting and observation to reach the point where she could use powerful language in her storytelling. What would you need to do to be able to write a passage like the one Llorente discusses? 3. Journalists have “a right and a responsibility” to make sure the language they use doesn’t dehumanize people, even subtly, Llorente says. How much responsibility do you think journalists have in this area? 1. 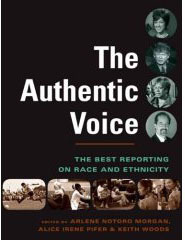 The foundation of Emerald Yeh’s story (KRON-TV, San Francisco) is an often unseen tension within a racial group. What do you know about the tension between Americans of Chinese and Japanese descent? What other examples of intraracial or intraethnic conflicts can you find? 2. Yeh talks about how she turned what easily could have been a voice-over (a brief in newspapers) into a substantial story. What are the stories in your community that could be expanded to a full-length report? 3. Yeh says she would have stopped taping had Helen Wong asked her to when Wong started crying. What would you have done? Are there any instances in which you would make a different decision? 1. Gabriel Escobar of The Washington Post talks about the challenges and advantages of sharing a commonality with his sources. With what groups do you share that kind of affinity? 2. Escobar says that speaking Spanish and understanding Latin American culture were advantages he brought to the story. Still, he maintains, any journalist could have reported and written this article. How would you do this piece without his skills and background? 3. What do you think of Escobar’s assertion that when a Latino does the reporting, it frees the newspaper from being criticized for its coverage of Latinos?